(Nanowerk News) Using a small boron-based molecule, glucagon—a hormone that plays a key role in pancreatic diseases—can now be imaged in live pancreatic cells. This breakthrough discovery was made by a team led by Young-Tae Chang from the Singapore Bioimaging Consortium of A*STAR ("Synthesis of a BODIPY library and its application to the development of live cell glucagon imaging probe). Produced in alpha cells of the pancreas, glucagon is a hormone peptide that, in partnership with insulin, maintains glucose levels in the blood. Glucagon production increases when the concentration of blood glucose decreases; an imbalance between insulin and glucagon results in diabetic disease. Glucagon secretion has been studied extensively, but progress has been hampered by a lack of suitable probes for imaging the hormone in real time inside live cells and tissues. The current method, using antibodies, can only be used to take a snap shot of a dead cell. “Our glucagon probe can be used for imaging live cells, over a long period of time,” says Chang. Fig. 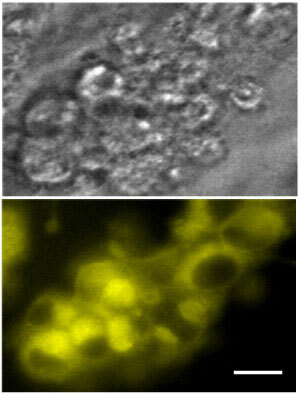 1: Fluorescent microscope images of unstained pancreatic alpha cells (top) and the same cells 24 hours after staining with glucagon yellow (bottom) (scale bar, 20 µm). In their alternative approach, the team first made a library of small molecules consisting of a molecular component (4,4-difluoro-4-bora-3a,4a-diaza-s-indacene, or BODIPY), which fluoresces when the molecule binds to glucagon directly attached to different chemical entities. The team selected 1,3-dimethyl-BODIPY as their fluorescent scaffold and reacted it with 238 different aromatic aldehydes in a microwave. This produced 160 compounds that were pure enough to be screened against live cells. This is the first report of a systematic construction of a library based on BODIPY, notes Chang. The researchers assessed the compounds using an in vitro high-throughput screen against three different live cell lines—pancreatic alpha cells, pancreatic beta cells (which produce insulin), and control HeLa cells. From fluorescent images taken at different time intervals, they found that one of the compounds exhibited a selective and highly fluorescent response to the glucagon-secreting alpha cell line. They named this compound glucagon yellow, owing to its yellow fluorescence signal and selective fluorescence increase upon binding to glucagon (Fig. 1).